» Forum » Tech » Tech: Early solid state » Bally - High Voltage Circuit - Common Failure? What is it? » Bally - High Voltage Circuit - Common Failure? What is it? Bally - High Voltage Circuit - Common Failure? What is it? I just checked all my Bally titles.. The HV circuit isn't working. Voltages are 239 - 242vdc. What's the common culprit here? C26 (160uf 350v)? If not what's the most common failure experienced? Have you tried adjusting the pot? yes on all three and it doens't work. I have the old cap at C26 on all three though. When the HV output is the same voltage as the input, usually the three transistors Q21, Q22 and Q23 are blown/shorted. Sometimes diode CR21 goes too and some resistors burn out as well as the pot. When capacitor C26 starts to go you'll notice the displays start wavering. An anomaly is the F2 (high voltage fuse) on the rectifier board. Night Rider shows it as 5A slow blow. Bally realised it was an error (the rectifier diodes after this fuse are only 1 amp rating - they will blow before the 5A fuse will), so they changed F2 to 3/4 amp slow blow fuse from Evel Knievel. However... the slow blow feature was not protecting the regulator components on the high voltage section of the solenoid driver board so somewhere around Dolly Parton onwards they changed it to 3/4 amp Fast Blow. 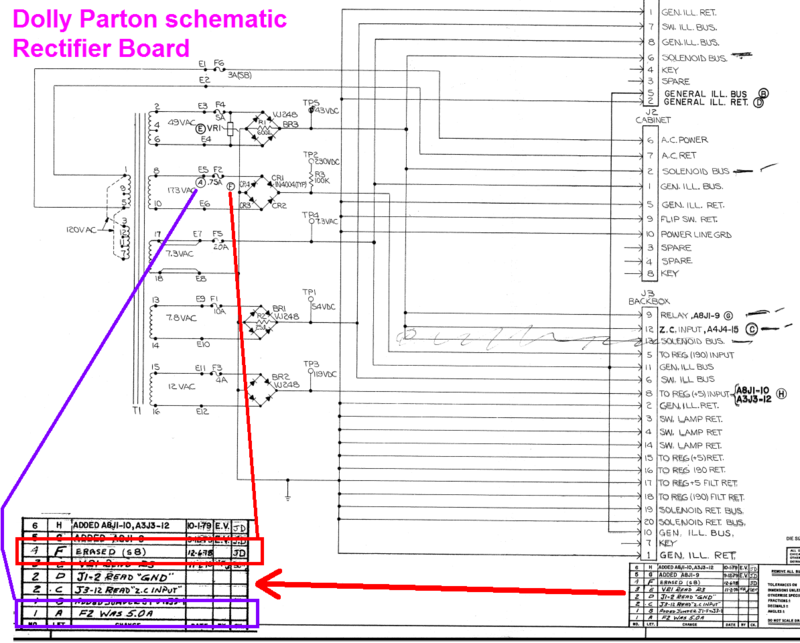 See below Dolly Parton rectifier board snapshot with engineering notes. So make sure the high voltage fuse on your rectifier boards are 3/4 amp Fast Blow, not slow blow. It seems that of all the tutorials on the Bally boards, the SDB doesn’t seem to get covered as throughly. Maybe it’s just me. So many things happening on the board. Had about ten driver boards, majority have no displays. No click on flipper relay, 5 volt hacks with weird looking components, all solenoids locked. TIP issues are no big deal. Any great detailed reading is appreciated. Pinwiki seems kind of light compared to the other stuff. I think the Bally pinball repair pages cover the SDB quite well, including the reliability upgrades. There is really not a lot going on on that board, it just looks busy because it provides a home for all the solenoid drivers which are just redundant circuits. Otherwise it provides a home for display and logic power conditioning, a home base for fusing and flipper relay, that's about it.